Who doesn’t like pizza? I know I do and I have friends who can confirm the mountains of Pizza boxes lying around my former apartments, where their empty remains lay stacked like a squirrel collecting nuts. Of course that was before I actually kept food in my fridge. The refrigerator, when I was younger, was merely a place to keep things that you used to put on food, like ketchup and mustard and to go boxes didn’t last long enough to make it to the fridge. I can honestly tell you I have not ordered a pizza for delivery in years, but now that I am writing about it I am craving a Papa John’s Pizza with ham, mushrooms, onions and an extra dipping sauce. Unfortunately, they don’t deliver to Europe. But I have a tasty treat here anyway. Having had a late lunch and still wanting a tasty snack to watch movies with, I decided to make these mini toasted pizzas. Start by preheating your oven to 200 degrees celsius using your upper grill element. 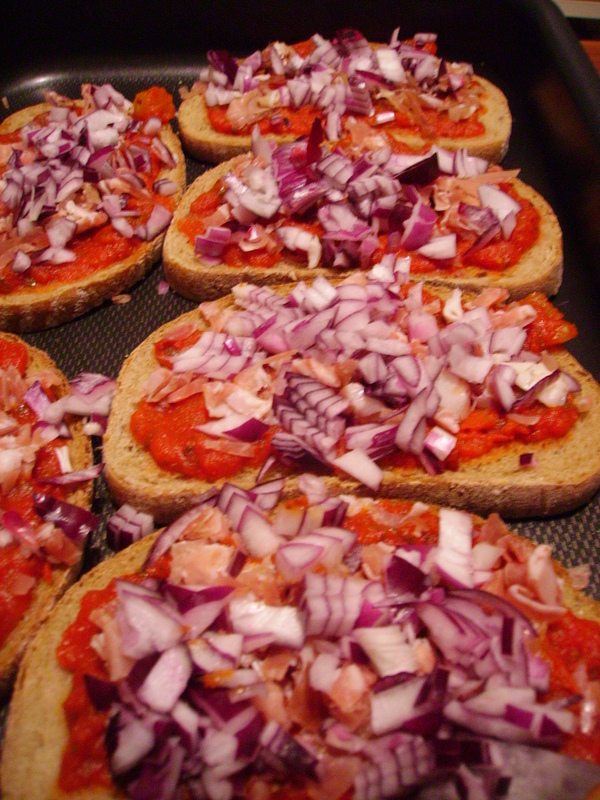 Toast the six slices of bread in your toaster and then place about 2 tbl of pasta sauce on each slice of bread being generous rather than just lightly spreading. 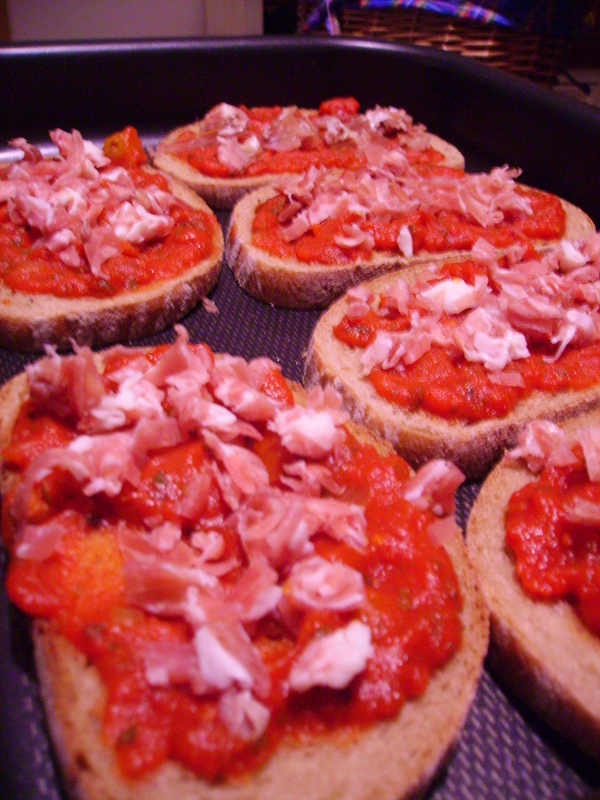 Take each slice of prosciutto and dice it up and sprinkle across the top of each mini pizza. Next take your red onion and dice it into 1/8 of an inch. 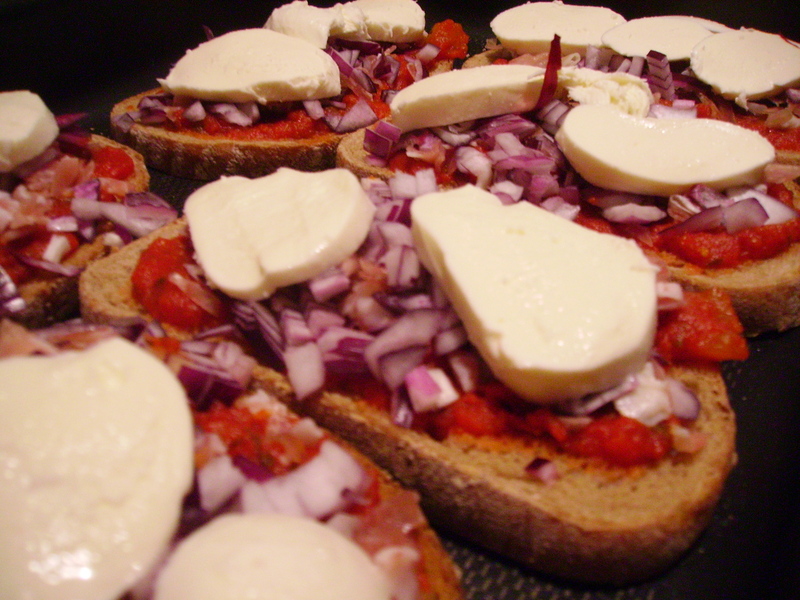 Sprinkle the red onion on top of each slice of the mini pizza and then slice your Buffalo Mozzarella into 1/4 inch slices. Place at least two slices of mozzarella per mini pizza, but where the slices are smaller you may need to place three slices. 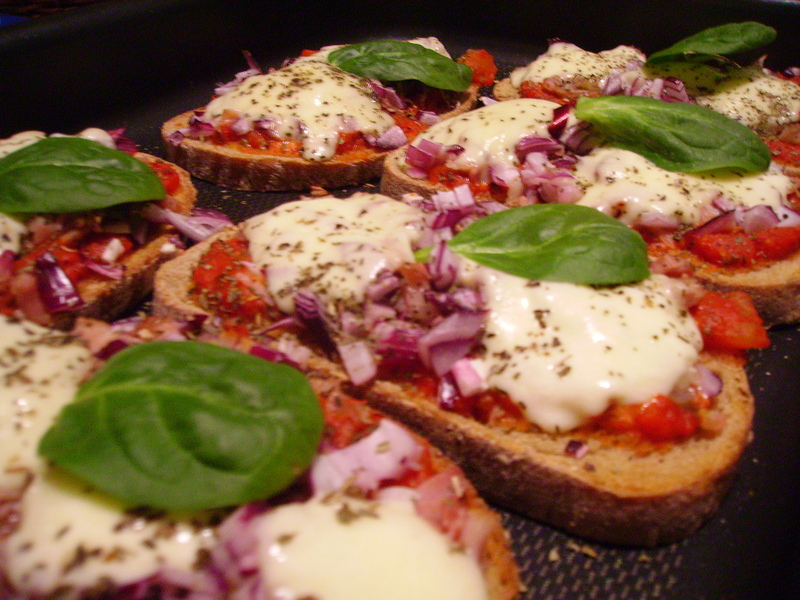 Sprinkle each slice of your mini pizza with dried basil and place in the oven close to the top. It should only take 5 minutes for these to warm up, and the cheese to have melted, so keep an eye on them so they don’t burn. When the cheese has melted to your liking, remove from oven, and garnish with one leaf of baby spinach, or fresh basil leave. Why order delivery when you probably have plenty of items in your fridge to create something very special. These took less than 25 minutes to make, far less time than have it delivered, and with far greater rewards. This entry was posted in Appetizers & Snacks, Baby Spinach, Basil, Buffalo Mozzarella, Cheese, Food, Herbs & Spices, Pasta Sauce, Pizza, Proscuitto, Recipes, Red Onions, Sauces & Marinades, Toast, Vegetables. Bookmark the permalink. I looooove Pizza toast – I always add some mushrooms or cubes of aubergines and courgette (and leave out the proscuitto as a vegetarian) – you can experiment with different types of cheese as well! I sometimes use smoked cheese if I miss the taste of ham ;-).